Healing is multifaceted. It goes beyond the physical and embraces the mental, emotional and social dimensions of individuals, families and communities. It takes a special person to understand the many nuances and usher in holistic healing. Lara Olson is one such special person endowed with the gift of healing. Lara Olson was happy to be back with her beloved friends in the village of SakhieGbomah. Little did she envision the work she would be doing – after all, the team was going there to paint a mural, not do medical work. 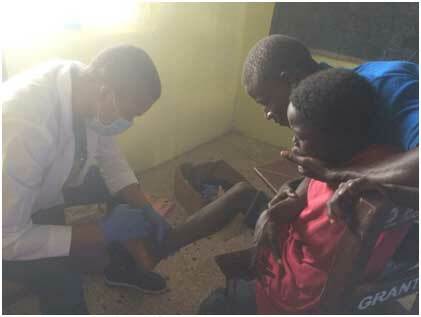 But when they arrived, the village had over 25 adults and children with Buruli Ulcers. Dressings had to be done twice a day. The room had to be cleaned repeatedly because the wounds were infected and would splatter as the patients struggled against the painful dressing changes. Little children were coming on their own, with no parents to hold their hands. As dressings were done, children would scream and had to be held down. A team of GT volunteers came alongside to help us. 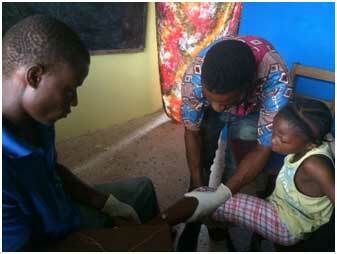 Augustine Shepoh has proved to be a man with a heart for the hurting and the wisdom to provide correct interventions. He continued taking care and treating patients long after the visiting team left. Our staff worked as a team along with our volunteers. Slowly, but steadily healing was evident. We are happy to state that there was a one hundred percent cure.Thank you GT staff and volunteers! Jen came to paint a mural but ended up helping young ladies learn breathing techniques to get through the pain of dressing changes and helped hold children still when the pain was too much for them to handle. Nathaniel (a resident of SackieGbomoh Village) learning to do dressing changes with Prince, a local journalist who is always ready to help Gathering Together in whatever way we need help. We really have some of the best volunteers on the planet! 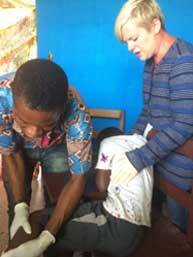 Augustine working alongside Nathaniel, Lara’s translator who eagerly jumped in to help treat patients. Training local residents what to look for and how to care for wounds when they first happen is part of our community outreach.